After a lucky escape from a horror fall at Chelmsford on Thursday evening, promising apprentice Josh Bryan is Australia-bound next week for work experience in Melbourne. 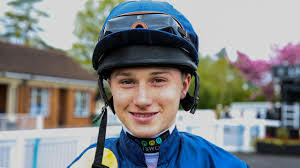 Bryan, 18, sustained a broken nose along with bruised ribs in the fall after his saddle slipped on his mount Hidden Stash in the closing handicap at Chelmsford. Speaking to the Racing Post for the first time since the incident, the teenage rider said: "It happened just past the two-furlong pole when I felt the saddle start to slip quite markedly. I tried my best to cling on but eventually became unbalanced and came off. "I ended up being trampled by some of the horses and I must admit I thought it might be worse than it turned out as I was struggling to breathe and felt very groggy as I lay on the ground. "I was ambulanced straight to hospital from the racecourse and it was a great relief when they found it was a broken nose and some bruised ribs. If it had been anything worse I don’t think I would be going to join Danny O’Brien in Melbourne or, at the very least, the working trip would have been cancelled for a while. "It's something I'm looking forward to as my boss Andrew Balding had kindly arranged it on my behalf. I'm following in the footsteps of Oisin Murphy and Kieran Shoemark, who have both made the trip in the last couple of years or so." In a breakthrough year Bryan has made giant strides as an apprentice jockey, partnering 30 winners to take his career total to 37. He added: "I'll return from Australia for the new year hopefully with more experience behind me and then it'll be a case of working hard to build up more contacts for the new turf season in March."